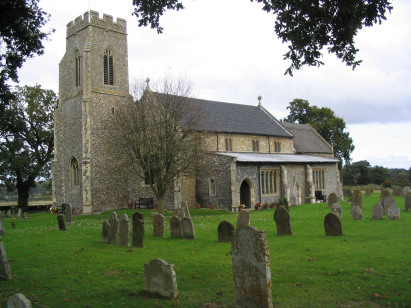 The parish of Sloley lies in eastern Norfolk about 3 miles south of the market town of North Walsham. Sloley sits in a network of lanes about 2 miles west of the A149 road which links North Walsham with the port of Great Yarmouth, it also sits alongside the railway line from North Walsham to Norwich. Sloley parish covers a relatively tiny area it being hemmed in by neighbours all around, there being six other parish churches within a mile or so of the village. Sloley is centred on a cluster of cottages grouped around a crossroads which forms a box like shape of a square with north south lanes leading off it. Sloley is relatively low lying, it sits in a slight valley where a tributary of the River Ant heads eastwards towards Stalham. Sloley is a quiet and tranquil place away from most busy roads and it is one of those locations you have to seek out rather than simply pass through. St Bartholomew's church sits a half-mile southeast of the village centre close to the rather strangely named hamlet of Frankfort (not a large German city but a cluster of cottages). Much of the external fabric of the church is due to 19th century restoration, Pevsner says it is "over restored". This rather masks what is underneath a fairly typical Norfolk church. 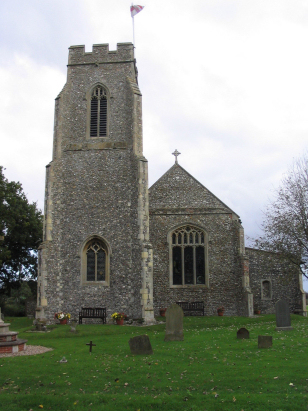 There are traces of the 13th century but most was erected during the Perpendicular period of the late 14th and early 15th centuries which is typical for a church in Norfolk. The standard layout of nave, chancel and western tower is augmented by arcades to north and south. This was quite a large building for a tiny parish. A single standard 800-entry register book covers the period and extends into the 20th century. This register is filmed on Microfilm MF598 in the collection of the Norfolk Record Office which was used to prepare this transcript. Whilst this film is not one of the more recent filmings it is nevertheless a good quality film with clear and crisp images making for straightforward reading. The handwriting is a little eccentric at times but is readable throughout making for a straightforward transcript to prepare.